On Friday, Oct. 31 the United Nations Human Rights Council will examine Iran’s human rights record in a process known as the Universal Periodic Review. Impact Iran, a coalition of human rights organizations, including OutRight Action International, is working to expose human rights abuses by the Iranian government and hold it accountable. The coalition is advocating for reforms that include abolition of the death penalty and expanded protections for children and women, religious and ethnic groups, and lesbian, gay, bisexual and transgender individuals. Coalition members are also calling attention to domestic violence, freedom of speech and assembly and Internet freedom. 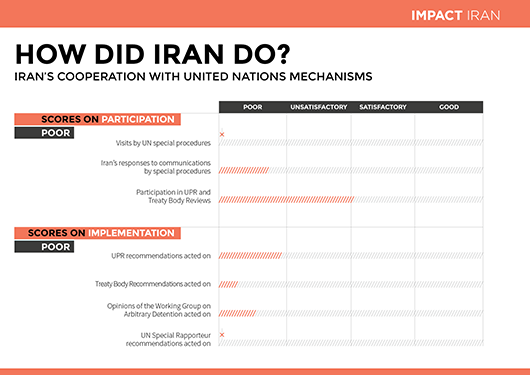 In preparation for the review, Impact Iran is campaigning to draw attention to human rights in Iran since, as documented in depth by upriran.org, there has been little to no progress on most of the 126 commitments made by government officials during its first Universal Periodic Review in 2010. A series of short videos will be released in the lead-up to the review. In “Promises Made, Promises Broken,” nine Iranians share powerful testimonies detailing abuse of their human rights. OutRight Action International along with our partner Iranian Queer Organization (IRQO) made a joint submission for the upcoming review. OutRight Action International and IRQO documented the ongoing violations of LGBT rights in Iran, including a 2013 raid of a private birthday party by Revolutionary Guards where 80 people were verbally abused and physically assaulted with pepper spray and electric batons. The report also documents several instances of Iranians being persecuted for “promoting homosexuality” online, in the press, and in one instance, at a University seminar. OutRight Action International and IRQO made several recommendations to the Human Rights Council in order to address these violations. Chief among them is the repeal or amendment of all legislation that is used to criminalize LGBT people, particularly Articles 233 through 240 of the new Islamic Penal Code. For updates on Iran’s second Universal Periodic Review, follow @ImpactIran and #UPRIran on Twitter. You can also watch a live webcast of the review courtesy of UPR Info at 9:00am, October 31 in Geneva. Click to see details in your local time.